Mr. G writes from China, wishing me to direct your attention to the latest poppet creation from Lisa Snellings, Poppet Reads The Graveyard Book by Neil Gaiman. 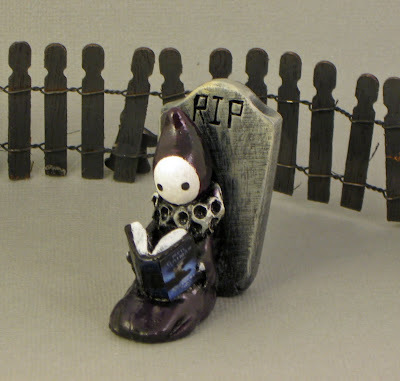 This is the first in a whole Poppets Explore The Graveyard Book series to come. Lisa is donating 20% of the sale from Poppet Reads The Graveyard Book and all other The Graveyard Book Poppets and art to the Comic Book Legal Defense Fund. For more information, straight from the artist, check her blog. The CBS Sunday Morning show will be airing a profile of Mr. G on Sunday, November 1. I received a request via the FAQ line for a list of books that Mr. G has recommended here over the years. I'm not aware that such a list had been compiled previously, so I started one on the neilgaiman.info wiki, based largely on the books that he has mentioned reading to Maddy. Please feel free to add to it.